Having covered the basics, we will now address some practical problems. In our prior examples, derivation and integration were always carried out with respect to time, but this is coincidental. Calculus problems can take many forms, they are by no means limited to time and motion studies. 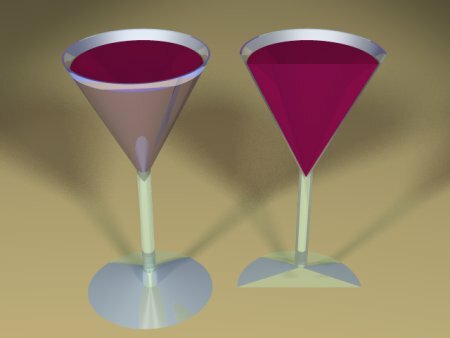 In this example we will compute the volume of a wine glass. Our first example glass is an inverted cone, shown as "example 1" on this page. How shall we proceed? Let's break the problem down into sections. First, remember when one integrates during a problem involving physical dimensions, one typically adds a dimension for each integration. Integrate a point to get a line, integrate a line to get a plane, integrate a plane to get a volume. This should be your first clue. Work out a function of y that produces the area of these discs. Integrate all the disc areas to get the volume of the cone. For a given glass, we would need to get a value for s, the slope of the sides of the container. We can measure the height of the vertical axis to the rim (height h), then the distance across the top of the rim (diameter d). The second measurement d may be divided by two to otain the radius r at the rim, and our slope value s would then be equal to r/h. 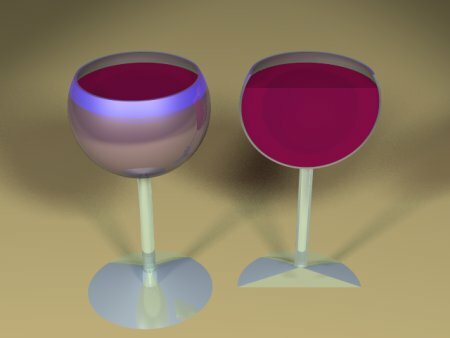 All right, we've computed the volume of one common wine glass shape. Here is another that is mathematically somewhat more interesting — it's a commonly seen wine glass in the shape of a sphere, cut off at the top. Once again, we need a function that will produce disc radii for y values. For this problem, we would need to know the radius of the sphere represented by the wine glass interior volume. In solving a real-world problem like this, we would measure the interior of the wine glass at its widest point and divide by two to acquire the radius. This value is applied as r in the equations below. This equation accepts y values between 0 and 2r, the diameter of the sphere, and returns the area of the horizontal disc represented by that vertical y value. As a sanity check, let's find out if the result equation to the right above can compute the correct volume for a full sphere. We know that a sphere's volume is equal to 4/3 π r3. In this case, let's choose an r value of 3 and a y value of 6 (the sphere's complete diameter. Yes, for a sphere with a radius of 3, 36 π is the correct volume. This means we can use this equation to say that, for a wine glass with an internal diameter of 9 centimeters (a radius of 4.5 centimeters) and a rim height of 6 centimeters, the volume is 282.74 cubic centimeters, a bit over 1/4 liter.